"Malcolm" came to us through the generosity of Damien & Helga Bourne. He needed a new home and on Malcolm McDonald's suggestion, Damien & Helga let this gentle soul make his home with us. Denise had seen his litter brother, Ch Tornadobe Johnny Cash, at the 1987 NDCA National in Melbourne and had been bold enough to ask Damien if he was for sale. Little did she know that just over 3 years later she would have "Malcolm". We had some wonderful wins with this boy who was in his prime when he made his way to us in early 1991. 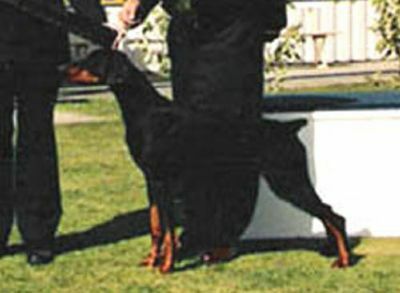 The most memorable, and special as his breeder Damien was there to witness it, was his winning Best In Show at the 1992 Dobe Club Of Tasmania Specialty under the late respected breeder and judge, Lyle Young. We lost "Malcolm" to cancer in June 1993.